Biophysics professors at Western University have developed a CT (Computed Tomography) scanner small enough to sit on a desk. Jerry Battista, Chair of the Department of Medical Biophysics at the Schulich School of Medicine & Dentistry and Kevin Jordan of the London Regional Cancer Program at London Health Sciences Centre invented the DeskCAT™ Multi-slice CT Scanner as a novel and interactive way to teach CT imaging techniques to a wide range of students. 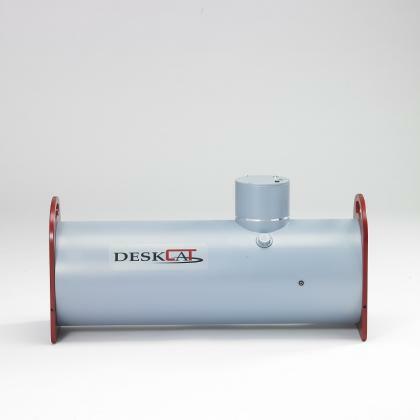 DeskCAT is now being manufactured, and distributed to other universities by Modus Medical Devices in London, Ontario. Clinical CT or CAT (Computed Axial tomography) scanners are large enough to handle a patient and occupy a large room. The donut-shaped scanner rotates a narrow fan beam of x-rays around the region of the body to be visualized. The x-rays are then detected and analyzed by a computer to create detailed images of the body part in thin slices, which can be stacked together to form a three-dimensional (3D) image. The DeskCAT scanner was invented out of educational necessity. "Teaching the basics of a CT scanner is very complicated. Usually you end up filling a board with equations, and students get lost," explains Battista. "It's hard to get access to a clinical scanner for a more practical explanation because of the heavy clinical workload. So basically, we miniaturized a CT scanner to bring it into the classroom." Rather than using x-rays, the DeskCAT educational scanner uses visible light rays to form multiple views of a transparent specimen. The mathematical method of reconstructing the 3D picture of the specimen's interior from many views through the object, is identical to that used in the full-scale clinical x-ray system. "The advantage of using light instead of x-rays for teaching is that the scanner can be brought into the classroom or laboratory without the hazards of x-ray exposure," adds Battista. "Another advantage is that students can 'see the light' passing through the specimen whereas x-rays are invisible to the human eye. This provides unique insight!"